The final moments of a hiker’s heart attack or a climber’s high-altitude bleed out from a wound that could have been butterfly bandaged together are unlikely to have been an emotive flashback through their lives. Instead, they only flashed back to the 100 or so times they thought about buying one but never quite got round to it. Avoiding such a ghastly fate should be a priority for all of us. This article will highlight the features of solid backpacking first aid kits and review five of the best ones around to help you find a reliable and hassle-free way of potentially saving your life. One of the reasons many of us put off buying one is the complexity of the options available. These kits come in many different shapes and sizes and a number of the items within them have a limited shelf life. Exactly which kit should I buy? Should I buy one that contains scissors and medication or one with only plasters and bandages? 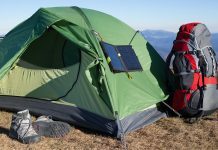 Is it worth the money if half of the items in the kit will be out of date within a year (and I only go on a big hike once a year!)? These are the kind of questions we ask ourselves. Questions lead to procrastination and before you know it you’ll be out on the trail with no kit or, almost as a bad, one you have little to no faith in. Let’s simplify matters and take a look at the features that make up a good hiking first aid kit. One key thing to look out for is to make sure it is designed for hiking. Sports ones or those created for use in the home or workplace make an assumption your hiking kit can’t afford to make. Namely, that you have been injured in the midst of civilisation and that professional medical help is within easy reach. Many of the items in standard kits will overlap with those in a hiking one, but when it comes to the crunch and you’re two days walk from the nearest hospital, you don’t want to discover that you lack potentially lifesaving items like splints for broken bones and triangular cravat bandages. Check out the contents list of one you’re considering purchasing to make sure they cover all/most of the above. Something else to bear in mind is how many people the kit has to serve. If you’re cursed blessed with many children or leading an expedition it should contain enough supplies to cope with the potential demand. Anyone who’s obtained a minor cut at work and opened the staff first aid box to find full supplies of everything except plasters (of which there are zero) will know how frustrating it is when supplies of a key item run out. Fortunately, most purchasable kits will specify what size of party they are designed to serve (individual, 2-4, etc). They may also specify how many days they should last for your group size on the trail so look out for this when it is time to select your kit. The contents are, of course, only as good as what they’re stored in. Let’s face it, they take some serious abuse. If it could talk they’d be tweeting with MeToo hashtags. They get thrown in packs, soaked with rain, bashed off rocks and exposed to extremes of cold and heat. Since wilderness first aid kits contain sensitive and potentially life-saving items like aspirins and anti-inflammatories – not to mention sticking plasters that are unlikely to stick very well if they’ve been submerged in freezing river water first! – it’s vital that your kit bag is made of sturdy, waterproof material. Ideally, your kit bag will also be compact and lightweight, so that it can be carried comfortably as part of your hiking pack. Finally, it’s worth paying attention to the interior of the kit. Does it have pockets, compartments and zips? If not, think about looking for a kit that does. They are there for emergencies and it’s far easier to find something in an organised kit with compartments than in a box where everything is jumbled together. It’s a small thing but potentially a lifesaver. One of the reasons the contents vary so widely is that the first aid needs of individuals vary equally widely. For example, someone who suffers from severe allergies might consider an epipen essential. The location of your trek is another factor to consider. If you’re hiking somewhere known as a poison ivy hotspot surely it makes sense to come equipped with creams that can manage the irritation of a rash. Be aware that purchasable kits are, therefore, likely to fall short of addressing every single need you or your party may have. Picking one may not be a case of selecting the complete package, but rather selecting the best base from which to build a kit tailored to your needs. Keep this in mind as we move on to reviewing five of the best backpacking first aid kits currently available! As its name suggests, this is compact. It measures 6 inches by 4.3 by 2.4 and weighs only 0.56 pounds, something that may catch the eye of lightweight trekkers or those seeking one for day trips only. The case is made from EVA (Ethylene vinyl acetate), a solid, porous material, and comes with internal dividers and pockets to help organise the supplies. The material of the case is waterproof, a key requirement, and an aluminium carabiner allows attachment to the exterior of your pack. In terms of the supplies themselves, the kit is marketed as containing 85 discrete items including key supplies like butterfly bandages. This product ticks a number of boxes! The second product on our list is another compact and lightweight offering. With dimensions of 3 by 5 by 7 inches and a weight of 11 ounces, the Northbound Train First Aid Kit is slightly larger and heavier than the I Go kit but still well within comfortable carry parameters. Those who put their faith in military men will be pleased to hear that the kit was designed in conjunction with a US Marine. Another of the kit’s claims to fame is its dual mounting system, which Northbound Train say allows it to be attached to the exterior of any pack. This mid-to-high price kit is another pleasingly compact offering, measuring 6.5 by 5.5 by 3 inches and weighing 7.2 ounces. The nylon bag has a reflective logo designed to make the bag easy to locate in the dark, a nice touch that could save crucial seconds in an emergency situation. The designers of the kit have incorporated another thoughtful feature to help out users: not only does the kit have various compartments inside, but a map on the exterior of the pack tells you in which compartment various items are stored. Again, this could save crucial time when time is most crucial. Unlike the previously reviewed first aid kits, the Adventure Medical Kit comes with medications designed to treat allergic reactions, itches, pain, inflammation and diarrhea. As its name suggests this Swiss Safe offering contains not one but two first aid kits, a standard kit with 120 items and an additional “mini kit” containing a further 32 items. This kind of flexibility could prove appealing to hikers seeking to go light on day trips with a mini kit, while retaining a thorough kit for bigger trips. The presence of two kits and so many options does come at something of a cost – with dimensions of 3 by 6 by 9 inches and a weight of 1.2 pounds the full set is by some margin the biggest on this list, albeit the individual mini kit provides an option for a smaller carry. The kit is FDA approved, signifying the quality of the contents, and an 18-page guide is included to help you patch yourself up on the trail without doing more harm than good! This Always Prepared first aid kit prides itself on being made in the USA. Buying something simply because it’s made in the country you live in might not seem like the smartest thing to do, unless you’re Donald Trump, but fortunately the kit has more to it than patriotic appeal. With a weight of 1.1 pounds and dimensions of 7.5 by 2 by 5.1 inches, the Always Prepared kit isn’t one of the smallest kits on this list but could still be considered efficient given the 126 pieces it contains. Notably, these 126 pieces include medications such as ibuprofen and hydrocortisone that some of the other kits on this list lack. A compass, emergency blanket and disposable poncho are handy extras, too. And the winner is…The Adventure Medical Kits Mountain Series Hiker. It was a close run thing. All the kits on this list have something to offer but the Adventure Medical Kits Mountain Series Hiker is the closest to the full hiking first aid package – lightweight, compact and with a comprehensive list of equipment that includes medications alongside plasters, bandages and the other standard items. With such tight competition among the various kits small details can make all the difference and the Adventure Medical kit benefitted from a couple of thoughtful touches that have the potential to save lives – a reflective logo to aid location of the kit in the dark and the packaging of the kit in four, mapped compartments that would allow swift access to the required items in an emergency. Those seeking a more versatile arrangement may prefer the Swiss Safe 2-in-1 First Aid Kit, which benefits from the inclusion of a mini-kit that could be taken for day hikes, while those expecting to encounter wet conditions may appreciate the extra security offered by the waterproof internal bags of the Northbound Train First Aid Kit. In truth, all of these have something to offer. Moreover, the kits are there to be tinkered with. If you think a kit is missing an essential item purchase it separately and add it! First aid is, in many ways, an organised form of improvisation. Any one of these kits should provide you with the platform to improvise your way out of most medical jams.